Who Was Joan Vollmer, the Wife William Burroughs Allegedly Shot While Playing William Tell? | Open Culture Who Was Joan Vollmer, the Wife William Burroughs Allegedly Shot While Playing William Tell? Who Was Joan Vollmer, the Wife William Burroughs Allegedly Shot While Playing William Tell? Popular culture knows William S. Burroughs primarily for three of the things he did in life: using drugs, writing Naked Lunch, and killing his wife. If popular culture remembers that wife, Joan Vollmer, it mostly remembers her for the manner of her death: shot, they say, as a result of Burroughs' drunken imitation of William Tell. But in life she played an important role in the intellectual development of not just Burroughs but other major Beat writers as well, including Allen Ginsberg and Jack Kerouac. As Brenda Knight writes in Women of the Beat Generation, Vollmer "was seminal in the creation of the Beat revolution; indeed the fires that stoked the Beat engine were started with Joan as patron and muse." 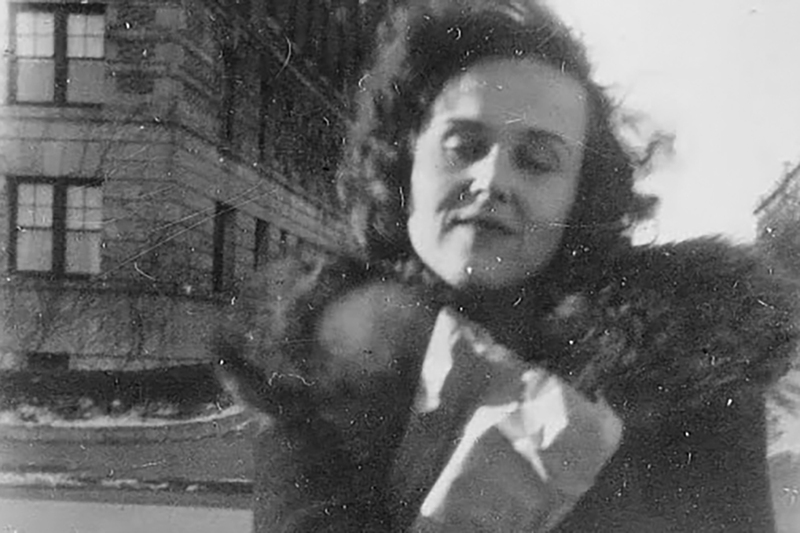 When her first husband Paul Adams was drafted into World War II, Vollmer moved in with her fellow future woman of the Beat Generation, and future wife of Jack Kerouac, Edie Parker. Into their series of Upper West Side apartments came a wide variety of substance-abusing artists, Burroughs, Kerouac, and Ginsberg included. Vollmer's new coterie, as well as her own amphetamine addiction, so appalled Adams that he left her upon his return from the military. She took up with Burroughs in 1946, later becoming his common-law wife and the mother of their child, William Burroughs, Jr.. In seemingly constant flight from the law, they moved from New York to Texas to New Orleans to Mexico City, where the fateful game of William Tell would happen in 1951. But did that game of William Tell happen? History has recorded that Vollmer did indeed die by gunshot, but as to exactly how or why it happened, nobody quite knows. Hence the investigations that academics, Beat Generation enthusiasts, and others have conducted since. The Burroughs-themed site RealityStudio has one page on Burroughs and the William Tell Legend and another gathering documents on the death of Joan Vollmer. You can get further in depth by reading "The Death of Joan Vollmer Burroughs: What Really Happened? ", a 70-page research paper by James Grauerholz, Burroughs' biographer and the executor of his literary estate. Despite his considerable interest in Burroughs, Grauerholz doesn't show an outsized interest in absolving the writer of his crime. But he does know more than enough to cast doubt on, or at least add nuance to, the simple story everyone "knows." Burroughs himself, though he gave contradictory accounts of the event at different times, never denied shooting Vollmer. He did, however, blame a kind of demonic possession for it: "I am forced to the appalling conclusion that I would have never become a writer but for Joan’s death," he wrote in the introduction to a 1985 edition of his novel Queer. "I live with the constant threat of possession, and a constant need to escape from possession, from Control." Vollmer's death, in Burroughs' view, "brought me in contact with the invader, the Ugly Spirit, and maneuvered me into a life long struggle, in which I have had no choice except to write my way out." Sound like self-justification though that may, the fact remains that Burroughs' life freighted him with plenty of conditions to write his way out of. It also went on for 46 years after the end of Vollmer's which, though short, saw her become, as Knight writes, "the whetstone against which the main Beat writers — Allen, Jack, and Bill — sharpened their intellect. Widely considered one of the most perceptive people in the group, her strong mind and independent nature helped bulldoze the Beats toward a new sensibility." Personally, I would be more interested in Paul Adams’ story.